Raleigh, N.C. – Residents from across the state gathered in Raleigh today to announce a new alliance of North Carolinians directly impacted by coal ash and to call on Duke Energy, the General Assembly, the Department of Environment and Natural Resources, and Governor McCrory to find permanent, safe solutions for coal ash that protect all communities from the toxic waste. The Alliance of Carolinians Together (ACT) Against Coal Ash is a statewide coalition of North Carolinians who live next to a current coal ash pond or proposed ash fill sites. ACT Against Coal Ash was formed in late July, when over 100 delegates from communities across the state came together in Belews Creek, N.C., home to one of Duke Energy’s largest coal-fired power plants, to share their experiences and discuss common goals. Duke Energy stores more than 108 million tons of coal ash in leaky pits and landfills across North Carolina; in some places it is illegally leaking into surface waters that supply drinking water to millions of people. The waste is laden with toxic heavy metals, including hexavalent chromium, a carcinogen found at unsafe levels in hundreds of drinking water wells within 1,000 feet of Duke’s coal ash sites. More than 300 families living near Duke’s coal ash ponds have been notified by state officials that their water is unsafe for drinking or cooking. Larry Mathis lives in Belmont, N.C. within 1,000 feet of the coal ash ponds at Duke’s G.G. Allen Power Plant, and next to an unlined landfill of nearly 280,000 tons of Duke’s coal ash, although the site is no longer owned by the utility. His community’s well, which is operated by Aqua N.C., a private water company, is contaminated. For decades, communities living near Duke Energy’s fourteen N.C. coal-fired power plants have been subjected to air and water pollution. A recent study co-authored by Duke University found that coal ash not only contains toxic heavy metals, but is also radioactive, posing even greater health risks than previously understood. Tracey Edwards, a life-long resident of Belews Creek and member of the Stokes County Residents for Coal Ash Cleanup, has seen and felt the health effects of coal ash pollution in her community first hand. 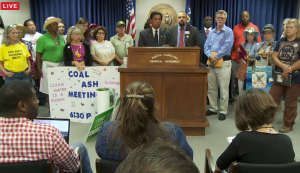 ACT Against Coal Ash members are disappointed by the lack of transparency from Duke Energy. The company is the subject of multiple criminal investigations and recently paid record-breaking settlement costs for violations of the federal Clean Water Act and Clean Air Act. Meanwhile, Duke recently released self-funded studies claiming that the plumes of contaminated water coming from their ash ponds are not affecting neighbors’ wells. Dawn Crawley owns a farm in Sanford, N.C., near a proposed coal ash landfill. Duke Energy plans to send ash from multiple other locations to new, lined landfills in Lee and Chatham counties. Duke will no longer be responsible for the ash, as the landfills will be owned and maintained by a limited liability company, Green Meadow. ACT Against Coal Ash is calling on Duke Energy and North Carolina decision makers to strive for the best possible solutions to protect communities from coal ash and to include impacted communities in open, transparent conversations about possible solutions.